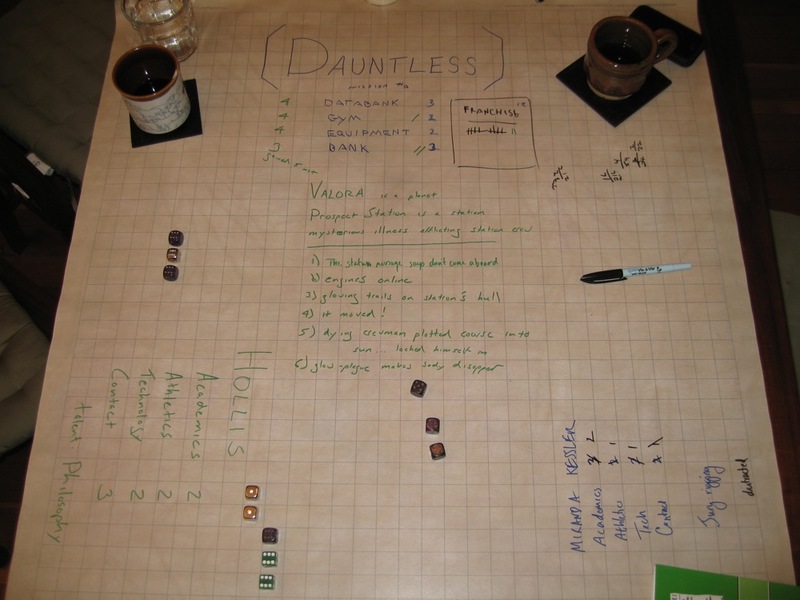 Spoiler alert: Like the other DAUNTLESS games, mission three was a lot of fun. Unlike the other missions the story didn’t really wrap up in one neat package. Why not? We accidentally skipped the mid-game pow-wow. Seriously: do not underestimate the power of the pow-wow. Once again Jem takes the GM helm and Ping and I take the player seats, bringing back Kessler and Hollis from game two, Trapped in the Void. Mike isn’t around so Stark is still absent, leaving Hollis the XO at the helm again. The DAUNTLESS is responding to a distress call from a remote colony. The colony itself is fine, but a mysterious illness is afflicting the crew of the orbiting Prospect Station. The station is actually the used up old hulk of the colony ship that carried settlers to this planet (which we spontaneously named Valora) years back. It was stripped for parts and left in orbit as a docking station and communication point, manned by a skeleton crew. So ends the intro. The DAUNTLESS is at 10 franchise dice but we don’t want a super long game, so we settle upon a 12 die mystery. There’s always a little moment of pause when we look at the total dice needed to solve the mystery. After all, with reasonably good rolls you can win 2 dice with every skill check — you can wrap up a mystery very, very quickly. Sometimes that makes things a little intimidating: everyone’s a little shy to roll the dice and potentially lock-in a chunk of the mystery. We agree that we’ve already spoken to the surface and gotten the intro, so the focus is on the station. I break the ice and open a hailing frequency to the station (successful Contact check) but narrate that all I get is a recorded message warning anyone to stay away. The tone is unmistakably hostile: they say they’ve sealed the hatches and they’ll repel anyone who tries to board. So friendly! It’s a recording so we have no idea how long it’s been in place. Kessler makes a sensor sweep of the station (successful Technology check) and announces that the station’s engines are warming up. Ping was clearly paying attention during the intro and is now taking advantage of the fact that the station is actually a decommissioned space ship to put us under a little more time pressure. Thanks Ping! We’re ready to move in but Jem decides to give us a push and reaches for the Stress dice: there’s a blaring alarm and a crewmen on the scanner yells out that the station has fired a missile at us! There’s a distinct pause, a “why does an old colony ship have missiles?” moment, and after a little consideration Jem re-describes it as some kind of a cargo pod they jury-rigged with boosters to launch it towards us. Crude but dangerous in close orbit. Clearly the act of desperate men. We embrace the idea and prepare to take our lumps. The junk-missile rockets towards the DAUNTLESS and we take evasive action. Kessler gets pummeled with Stress damage, while Hollis remains cool as a cucumber and navigates the ship to a higher orbit where the would-be saboteurs won’t be able to get another shot at them. This becomes an ongoing theme for the game: Kessler takes a total of 5 Stress hits this game and Hollis takes nada, zero, zip. Leery of more drastic measures by the crew of the station, Hollis orders a boarding party to don vacc suits: they’re going to keep the DAUNTLESS at a safe distance and then space walk over. Yeah it’s true: any chance I get I suggest a space walk. Really, what’s the point of going all the way into space if you aren’t going to go for a walk? Sitting on the bridge reading sensors all day is for sissies. Since we’ve already been met with hostile force the boarding party is a mix of security and medical personal. It’s still a rescue mission, but everyone is armed and sternly ordered to defend themselves if they have to. Hollis is leading the party personally (of course) and Kessler argues that she should come along to head up the medical team (of course). That’s all just as it should be. Hollis makes a check for the space walk (successful Athletics). It’s a breeze, but I narrate that even as we drift cautiously towards the silent hulk, what we _don’t_ see is that on the far darkside of the station there are glowing trails criss-crossing the hull, like the luminescent trails of some alien snail. Dum dum dum! Are they only on the far side, or are they only visible in the dark? We don’t know. After the boarding party touches down and is milling around trying to override one of the cargo airlocks to sneak aboard, Ping decides to drum up some trouble, so she says that while Kessler is standing around taking readings (successful Technology check) she spots a hint of the glowing stuff at the edge of the darkside of the hull and wanders over — alone — to check it out. But just as Kessler’s stooping to take a closer look Ping narrates that the ethereal slime lashes out at her! She yells and recoils and the rest of the party bounds over, but by then there’s no sign of motion. Was it just her imagination? She’s frazzled and her frantic protests that “it moved!” are met with skepticism — no one listens to the person who’s already taken Stress damage on their Contact. Just like in the last game, I’m secretly angling to show different sides of our characters than we have before. Sure enough, we’re once again in different roles: faced with a medical threat to the crew and the possibility of armed resistance, Hollis is all hard-nosed authority, issuing side-arms to the boarding party and warning them to exercise extreme caution. Kessler wants to go play with goo on the hull, but Hollis is shutting her down and telling her to stick with the plan: the people on board probably need medical attention. They come first. It’s a flip (again): now Kessler is the idealist (um, scidealist) and Hollis is the close-minded by-the-book commander. After all, he hasn’t seen anything weird yet and she has. Attentive readers will now notice our mistake: that little chat on the hull was the halfway point. We should have had a pow-wow to theorize about what our characters thought was going on. We did have a good roleplaying interaction, but we never discussed the actual mystery. Once inside Hollis orders the boarding party to split up into teams and secure the station (successful Contact check). Its spooky creeping through dark hallways with flashlights — still in spacesuits of course — and with my success I narrate that we have to overide the lock on the engine room because a dead crewman has sealed himself inside. The logs show that he set the engines on autopilot to fly the whole station into the sun (as soon as they finish coming online). I also add that he’s not just dead, but whole sections of his body have vanished — they’re still there in some sense, because for example his arm is still attached even though his whole shoulder has faded into non-existence. Are they invisible, warped into some lower dimension but still physically attached? As usual, we don’t know. Kessler gets the call to come examine him, but as soon as she starts Jem grabs the Stress dice and declares that the not-as-dead-as-we-thought crewman opens his eyes and grabs her. There’s a quick “wait, do you mean he’s alive or do you mean he’s a zombie” dicussion which comes down on the “he’s alive” side. More Stress damage for Kessler and then the hysterical crewman is sedated — which we rapidly decided was probably a dramatic misstep, since asking him what had happened would have been more interesting. Too late, he’s out. Kessler goes ahead and examines him (successful Academics) and uses her success to narrate a completely unrelated fact that the whole station suddenly starts shuddering. Sneaky duck! Now normally that would be fine, but this is the second to last clue and it doesn’t get us any closer to an answer. We also don’t know if the shuddering is the engines firing up to fly us into the sun or the slime on the hull coming to life godzilla style. Down to our last mystery dice, Hollis overrides the engines (successful Technology) and forced to wrap-up I describe that the goo on the hull does indeed seem to be reacting to the sudden firing of the engines (the vibrations? the radiation?) but once we cut them off it settles down. It isn’t an intelligent creature, more like a space mold or fungus. Prospect Station is saved and (theoretically) we’ll be able to tend to the other crew members, assuming we find them. The end, sort of. I know what you’re thinking: that game wrapped up somewhat inconclusively didn’t it? Yep. We didn’t move towards answering the mystery fast enough, so when the last franchise dice got earned we still had a lot of explaining to do. As I mentioned at the outset, a big part of the problem was that we unintentionally glossed over the half-time pow-wow, so instead of solving the mystery in the second half we were still wading through random events. The details were all there, so I think with a little liberal epilogue we could have wrapped it up if we tried. A fairly simple explanation (in hindsight) is that the goo on the hull was something carried along in space that hit the hull and then spread. The crew either brought it aboard for examination or (more likely) carried it in by mistake while working out on the hull, just like Kessler with the goo on her suit. As far as treating it, we’d already seen that it wasn’t making the hull disappear, so we could have easily narrated that it behaved differently in vacuum than it did in atmosphere. InSpectres has a rule that you only earn half the franchise dice if you solve the mystery early, and I think the same penalty would fit for solving the mystery late or not at all. On the bright side we already played game four and it was a win: we learned from our mistake and made sure to pow-wow. Yeah you’re right — we’ve been having fun forcing a dramatic finish when all the dice are earned (using the franchise dice for story pacing) but we could just keep going. If I remember the details of an InSpectres review, the rules say that you can’t solve the mystery until you earn all the franchise dice, but you can keep going after if you want. I got the impression that it was a “can’t finish early” rule, not a “have to solve it now” rule. I don’t yet have a copy, so I can’t look it up to find the answer.